A cult requires certain things to grow and survive. Firstly there is the central belief. This can be almost any belief, and that belief doesn't even have to be true. This could be a belief that the world is about to end (doomsday cult) or that somebody is divine (religious cult) or that your race is better than all others (racist cult) or aliens regularly visit the Earth (UFO cult) or that by committing an act of atrocity you will get a free pass to heaven (terrorist cult). Secondly there have to be charismatic leaders that preach the belief. Others look up to them and become believers and start preaching the central dogma. If a critical mass of people believe the dogma then the cult stands a chance of becoming truly global. Once this happens it can take generations for a cult to die out. For example, many Scandinavians continued to believe in the Norse gods Wotan and Odin until the twelfth century when these beliefs were finally supplanted by Christianity. Some cults, such as the cult of Steve Jobs which is centred on the Apple brand, are fairly benign (but expensive). Others, such as terrorist cults, are harmful but they persist. Certain people, by dint of their intelligence and insight, can select assets that will give better returns than the market as a whole, and they can do so consistently over decades. By looking at past performance it is possible for investors to find these people, give them their money and earn returns better than the market as a whole in return for a fee. Alpha is jargon for the extra return that is generated above movements of the market as a whole. If we want to track the market as a whole, a return called beta, we can now buy exchange traded funds that charge as little as 0.07% of our investment per year. We pay several times as much, often above 1.3% per year, for alpha because it requires asset selection skill. We used to be so certain that individuals could outperform the market that we would pay them a fee whether they succeed in beating the market or not. 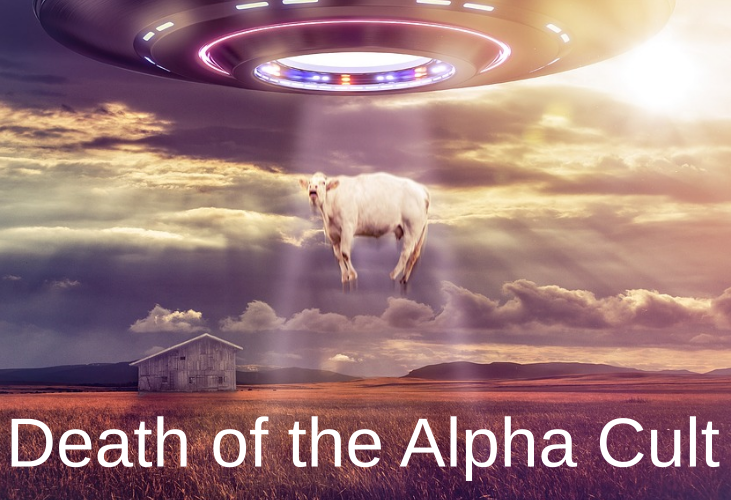 The Alpha Cult has been great for fund managers because once they have had a good run, more often by luck rather than skill, people flock to their fund. The size of the pot they manage, called Assets Under Management (AUM) grows quickly as a result. A successful fund that has £1 billion in AUM charging a fee of 1.3% would earn £13 million per year. They will appear in the media giving their opinion about markets, fund platforms will eagerly promote their fund and the Cult rolls onwards. The difficulty with knowing whether someone can outperform markets consistently is to track their performance over a long period of time. If they are outperforming due to skill then they would continue to outperform. If they were just lucky in their stock selection then their outperformance will start to wane over time. The ratings agency Standard and Poors has performed this tracking exercise with their Persistence Scorecard. They look at US equity mutual funds which have beaten their peers over five successive 12 month periods and track this elite group over time. Here's the table from their report which shows how many of the elite top 25% performing funds remain in the top 25% over successive years. If this outperformance was thanks to skill then you would expect the top performers to remain top performing for several years. If the outperformance was due to luck then you would quickly see performance fall back to the average over time. The number of persistently outperforming funds falls rapidly to 26% in the first year, 4% in the second, 0.5% in the third and 0.3% after 4 years. Here's the same data presented as a picture. We start off in March 2013 with our elite group of stock pickers coloured in red. 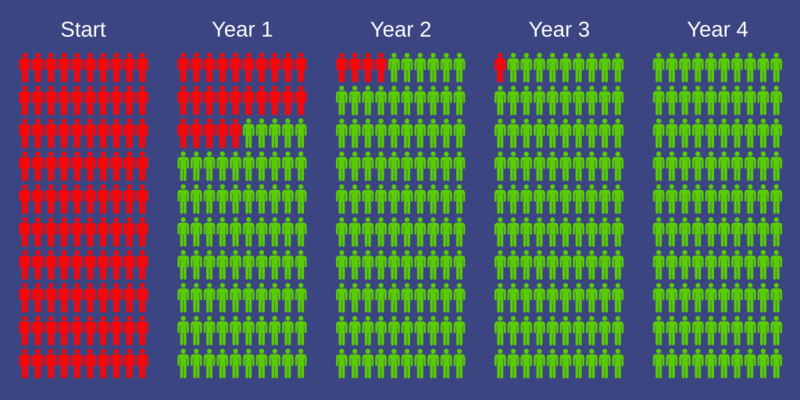 As their performance lags and they fall out of the top 25% performers they turn green. You can see the performance falloff is dramatic. The conclusion is that the outperformers were just lucky. As usual in finance the US is ahead of the game. The public tend to be more engaged with share and bond markets than in Europe and so are more sensitive to the fees they pay and performance they receive for that fee. In the US it is much more common for people to invest their own pension money than in Europe in 401(k) schemes and so this engagement and understanding of markets is a necessity. With the new pension freedoms in the UK we will be taking more control of our finances and one benefit will be increasing awareness of fees and performance. In the US investors have been steadily shifting their money out of high-fee active funds into low-fee passive exchange traded funds. Of the $14 trillion managed in US mutual funds the passive share has increased from a quarter to a third over the last three years. In the US over 40% of households own Exchange Traded Funds compared with just 11% in Europe according to this FT article. The assets under management in ETFs was four times larger in the US than in Europe at the end of last year ($2.4 trillion in the US and $567 billion in Europe). It seems that we need to believe in something and so cults don't die out, they are replaced. Jesus replaced Wotan and now we find that Jack Bogle is supplanting the Alpha Cult. In case you haven't heard of him, or his followers the unfortunately named Bogleheads, here's his picture and his investment dogma. To see more take a look at the Bogleheads Wiki. Develop a workable plan e.g. a household budget, live below your means. Invest early and often. Compound interest will work its magic long-term. Never bear too much or too little risk. 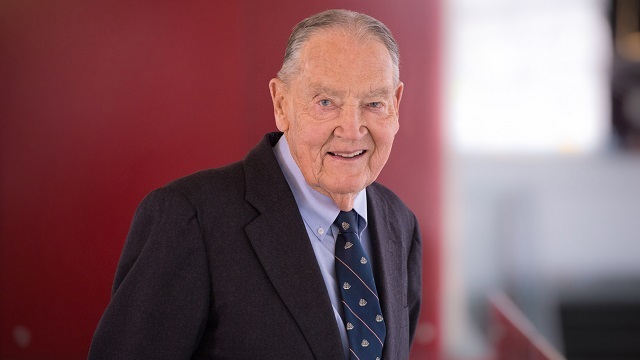 The primary driver of risk is the amount of equity in your portfolio and Jack Bogle's guideline is your age in bonds (age 20 means 20% bonds, 80% equity, age 40 mean 40% in bonds, 60% in equity) so you gradually reduce risk as you get older. Diversify. 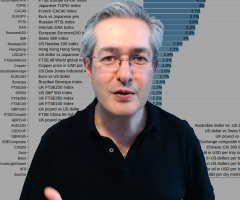 Don't put all your eggs in one geographic, sectoral, or asset class basket. This reduces your risk because it is unlikely all markets will crash simultaneously. Never try to time the market. Don't hold back cash in the expectation of a crash or put in extra cash in the expectation of a rally as these are unpredictable. Use index funds when possible. These track an index, usually cheaply. Keep costs low. Fees compound over time as well as returns. The difference between 1% per year and 0.1% per year over a lifetime can be staggering. Minimise taxes. In the UK we have tax-efficient wrappers such as ISAs and SIPPs. Invest with simplicity. Keep the number of funds you own to a minimum, Bogle suggests just two are sufficient for many investors. This new cult is not without its problems. As money pours into Exchange Traded Funds the plumbing that goes on behind the scenes can start to groan under the pressure of new demand, particularly for small markets where there are simply less assets to buy and small daily trading volumes, such as Emerging Market bonds. These have proven popular because they give an oasis of higher income for investors starved of yield in developed markets but there are signs that EM bond ETFs are beginning to dominate this relatively small market. Some commentators, often active fund managers, say passive tracking will distort asset prices. By investing according to index weights, which are usually based on the size (or market capitalisation) of a company there is no discrimination based on earnings performance. 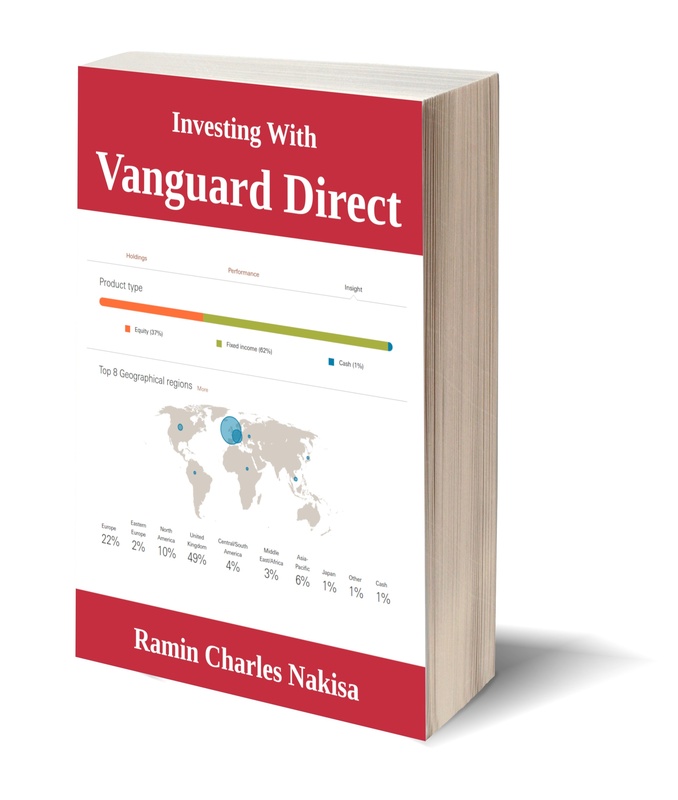 A company that is profitable should be rewarded with a higher share price and this process does not occur in purely passive funds. A research note from the (active) fund manager Sanford C. Bernstein entitled "The Silent Road to Serfdom: Why Passive Investing is Worse Than Marxism" argued that the dominance of passive funds leads to an inefficient allocation of capital. There are now a few funds, such as Orbis, that put their own income at risk by charging performance related fees. If they don't beat the market they will underperform just like their clients. While this relationship was indirect in the past, as poorly performing funds would suffer client withdrawal of capital, performance-related fees make the link transparent and immediate. We work hard to keep﻿﻿ it interesting!